In the first instance, Carven Pour Homme is dominated by violet leaf. Violet leaf, with its watery sweet, earthy and green facets, is a masculine staple that provides a distinct sense of freshness that is smart rather than sporty. It is used to good effect in Carven Pour Homme where it feels particularly grey and earthy, evoking the idea of a comfortable turtleneck tailored out of soft jersey. There is a subtle sharpness, the collision of grapefruit and cedar, perhaps, that gives a muted undercurrent of bitterness, ensuring that things are nicely in proportion and never too green, too sweet or too humus-like. In fact, “nicely in proportion” is a great way to describe the fragrance as a whole. Under the hood, Carven Pour Homme has a whole heap of wood keeping things going. I want to call the woody effect ‘rugged’, but that doesn’t quite fit because the edges of these cedar wood and sandalwood chippings have been sanded down to a relatively smooth finish. The grains and knots of the woods are represented as a spicy warmth with a few savoury nuances. Interestingly, things become more ashy and vetiver-centric in the dry down, with this specific vetiver note providing a gauzy metallic air that adds a touch of hardness to what would otherwise be an entirely rounded scent. Carven Pour Homme could be criticised for being a bit too safe, and it is. If you’re looking for a unique and entirely new olfactory experience, this will not be the masculine fragrance for you – it’s not a wild card, nor is it a dramatically exciting fragrance, or even anything particularly unusual. 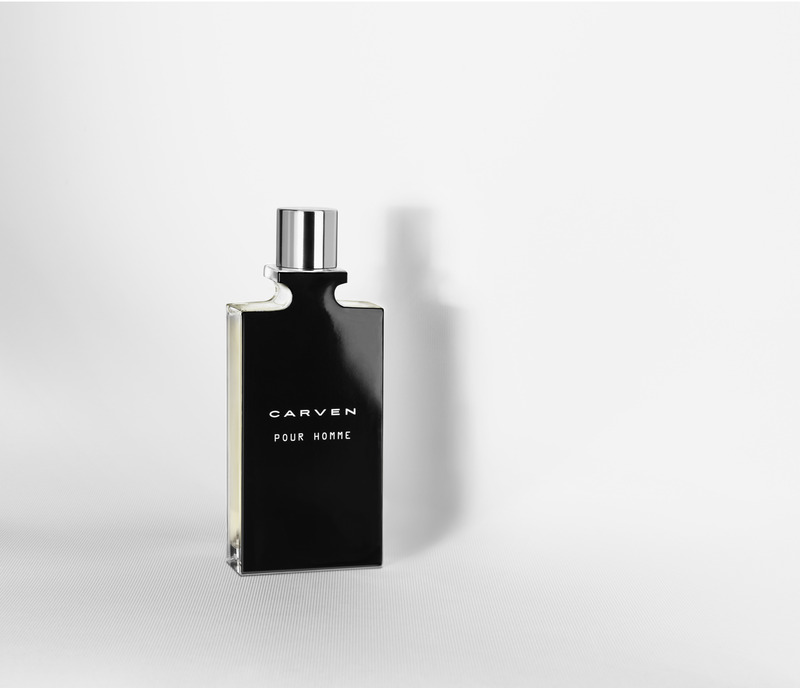 Instead, Carven Pour Homme displays a comfortable and relaxed signature that shows a tried and tested method of masculine perfumery executed rather nicely. It speaks of a sensitive and artistic soul that is both handsome and kind. He is striking because he is affable – a kindred spirit that speaks softly and listens intently. 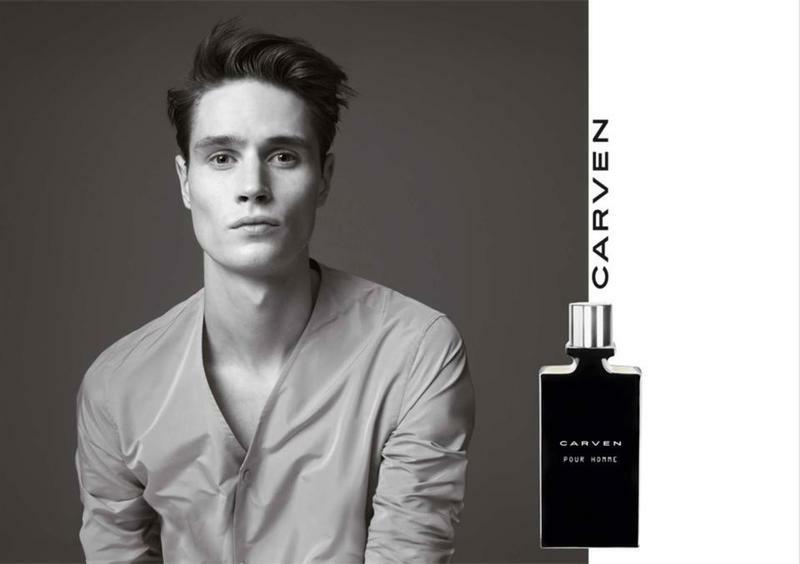 Carven Pour Homme is available in 30ml (£35), 50ml (£50) and 100ml (£70) Eau de Toilette. A series of matching grooming products, including; an After-shave Spray, Deodorant Spray, Bath and Shower Gel, and After-shave Balm, are also available. Sample, notes, quotes and image 2 via Carven. Image 1 via thefashionisto.com. Posted in Carven, Masculine, Perfume Reviews and tagged Carven, Carven Pour Homme, Fragrance, Francis Kurkdjian, Guillaume Henry, Masculine, Patricia Choux, Perfume Review, Violet Leaf, Woody. Bookmark the permalink. This was a surprise to me. The first time I sprayed it there was a flashback to Le Male which I find overpowering and the stereotype of a masculine fragrance. However, on repeat wearings (like today) I’ve come to appreciate it more, especially in the dry down when it becomes a tasteful “safe” everyday fragrance. Does he now? I’ve heard he smells pretty good most of the time. I think you summed this one up for me. It’s a comfortable everyday scent.